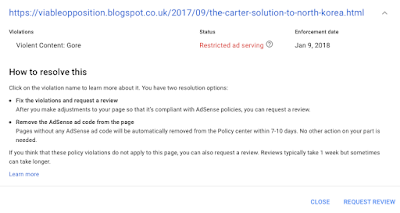 As a relatively long-time blogger, I have availed myself of Google's Adsense to generate a rather insignificant amount of income by posting their ads on my website which is also hosted by Google. 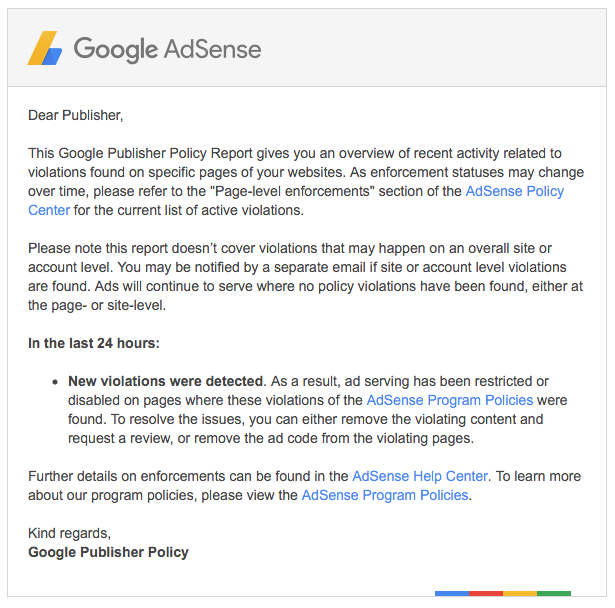 In this case, Google wields a big stick; at their discretion, they can cut off Adsense on any offending pages meaning that I could find myself with my already meagre Adsense income reduced even further. Let's look at some details about the offending posting. 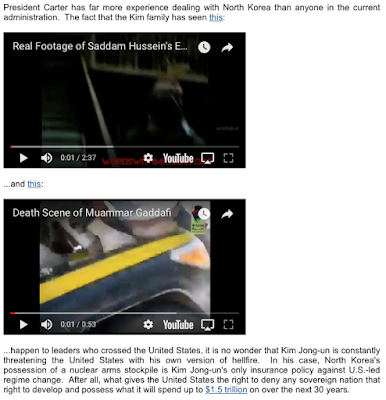 You will notice that the single posting on former President Jimmy Carter's solution to the ongoing North Korea crisis was deemed offensive because it contains "gore". In this case, as part of the message that I hoped my readers would take from the information that I provided, I provided links and embedded versions of videos taken during two executions; the execution of Saddam Hussein and the rather violent execution of Muammar Qaddafi at the hands of his fellow Libyans. For those of you who aren't aware, Google (now Alphabet) purchased YouTube for $1.65 billion in October 2006 and, as such, is hosting videos containing "gore" on its 100 percent owned subsidiary. Now, that's ironic! What is even more ironic is that the video of Saddam Hussein's hanging has been viewed 1.967 million times on YouTube and that there are six versions of the same video on YouTube. One of the videos has been on YouTube since December 30, 2006. The video showing the execution of Muammar Qaddafi has been viewed 1.892 million times, was taken from ABC News and has been on YouTube since October 21, 2011. As well, there is at least one additional version taken from ABC News that has been on YouTube since October 20, 2011 and has garnered 1.551 million hits. Ah, the wonderful world of corporate censorship. 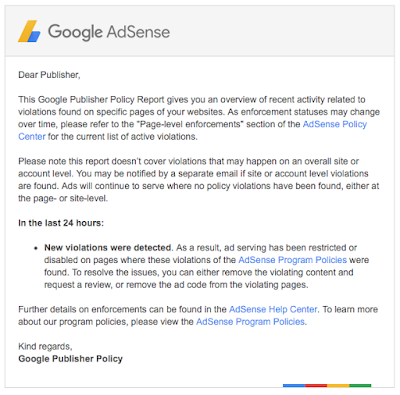 ...and yes, in case you were wondering, I caved in to the will of Alphabet and removed the offending videos since I feel that the posting's message of a peaceful solution to the North Korea problem is too important to ignore. I can't help feeling that A.I. is going to turn out as dumb as we are. I think that it already has proven its as dumb as its maker! 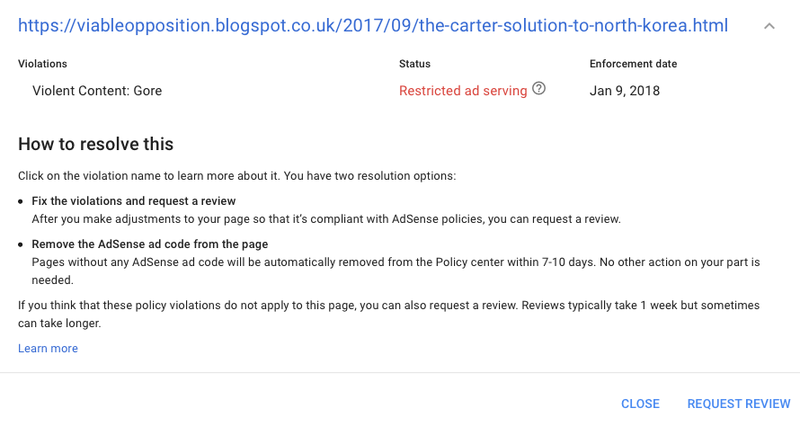 Well, at least they allow you to use Adsense (AdCents(?)). I tried to get it on one of my websites, and was turned down for for a spurious reason, with no recourse. Since they've cornered the market they can do whatever they please. That's the definition of a monopoly.